Car mechanics and model railways don’t usually make great bedfellows but here’s one garage accessory you might want to consider. 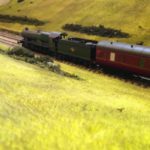 If you’re like me, you spend a lot of time crawling around under your layout bent at odd angles fitting and fixing wiring, motors and electrics you’ll often suffer painful, uncomfortable, backache. Worse, as we get old, even crawling around upside down under the baseboards becomes a struggle. On a recent conversation about baseboards on the Model Railway Engineer Builder’s community, one of the members suggested car creepers as an aid. As someone who prefers leaving the inners of cars to mechanics, I was initially at a loss about this. What on earth was a car creeper and how could a car tool — thoughts of big heavy wrenches sprang to mind — possibly be of use on a model railway let alone help with backache? A bit of research was all it took and for my eyes to be opened to the possibilities. Car creepers it turns out are platforms you lie on but have wheels so they can move around under the car. A mattress on wheels if you will. The value of the suggestion on the Facebook Builders group was obvious. You lie on them, face up and can then slide under the baseboards. No bending, stretching and some of them – such as this one ( and here for the equivalent for American readers) – are cushioned to make them more comfortable. Some even have lights to aid visibility in the dark corners of the baseboard. They could also be made for model railway construction! They seem ideal and are now on my wish-list and I’d love to hear from anyone else who is using them for our hobby and has found they help with their backache. Disclaimer: Some links on this page will take you to Amazon or eBay through which you can buy the products mentioned. These links are made under the Amazon and eBay affiliate scheme which means that although the price to you doesn't change I get a small commission on the orders you place. Please see the disclaimer for more details. Great idea! I’ve been using one for a while–a friendly electrician gave me an old one. It’s just wood, so I put an old bathroom rug on it as a cushion.